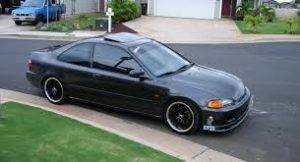 This is a 1995 Honda civic EX This one turned out really sharp. And new wheels. It’s even got the red caliper accents on it. 4 wheel disc brakes. And then the. Even that really nice exhaust system. Said cat back spec D Exhausted from that we’ve got on here. Spoiler even. So it’s got the. Real sporty look to it. I think this is a pretty sharp looking vehicle personally. And You can see even just looking at the side of it. That it’s been lowered a we’ve got brand new. Lowering springs on their. If you don’t like the height of it’s actually adjustable so you can. Put it up for. If you really want low like Lolo you can put down even further. Force her like this. Is it really, Please without the 5 speed manual transmission. Sun roof. That pretty much hell were everything. Snow power windows. Power locks. Holden years even. 59000 miles. Children this is a 95 Honda civic it’s got plenty more miles left to go on it. Aftermarket stereo also has an aftermarket gets. Stripped speaker system in it as well custom brick in gas pedals. Go ahead fired up. And see for shippers. But It The Show fires up right away. Great places because of it. Great I No That makes us. Sounds really nice. It does come with a silencer. But in the back. So if you like the sound of it but don’t like the volume of it you can only as. Super LED 95 Civic headlights.Through that back in there. One 6 The Older Full One All they had Does Read. We’re for You’re all so The Return those. I As a header on. Racing spark plug wires. But. And then that’s how she looks driving down the road with lights on. So a really nice car. It will be really fun to drive. I’ll definitely be said to see this one go.